The brand new Eurostars Budapest Center 4* superior is ideally located in the famous Kossuth Lajos avenue, in the heart of Budapest only a 2-minute walk from the Danube river. The Eurostars Budapest Center has been designed with an inside courtyard, which provides a relaxing space for resting after a busy work day or a Budapest sightseeing tour. 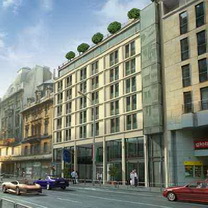 Eurostars Budapest Center hotel is located on the famous Kossuth Lajos avenue close to Elisabeth Bridge and Franciscan Square. Trendy boutiques, great restaurants, theatres and concert halls are all easily accessible on foot or thanks to the excellent public transport system in the area. Guests can choose from elegantly furnished rooms and spacious suites, all featuring free wireless internet access. The Eurostars Budapest Center also has a fine restaurant. The Eurostars Budapest Center provides 175 spacious, well-lit rooms, equipped with all the details befitting a hotel of its category, with wooden flooring, elegant furniture and the best in technological appliances. The hotel also has six junior suites of almost 40 square metres and very different ambiances: a complete luxury treat just a step away from the Danube.